I go through phases where I pack my lunch and bring it with me to work. Inevitably, I get tired of eating my sad little sandwiches, and start buying lunch again until I get fed up with the food in the area (and my wallet starts to protest) and then I go back to bringing my lunch for a bit. Part of the issue is that I usually get lunch from the veggie cart, so variety quickly disappears. But twice a month, I get lunch from the chicken and rice guys up the block. It's a great deal if you can put aside your misgivings about buying food from a cart: five bucks gets you a lunch of rice, chicken or lamb or kebabs, salad, and if you ask for it, veggies too! Plus you get a drink. Non New Yorkers, let me tell you, that is a serious deal since sandwiches and salads can run in the range of about $8.00 or so. 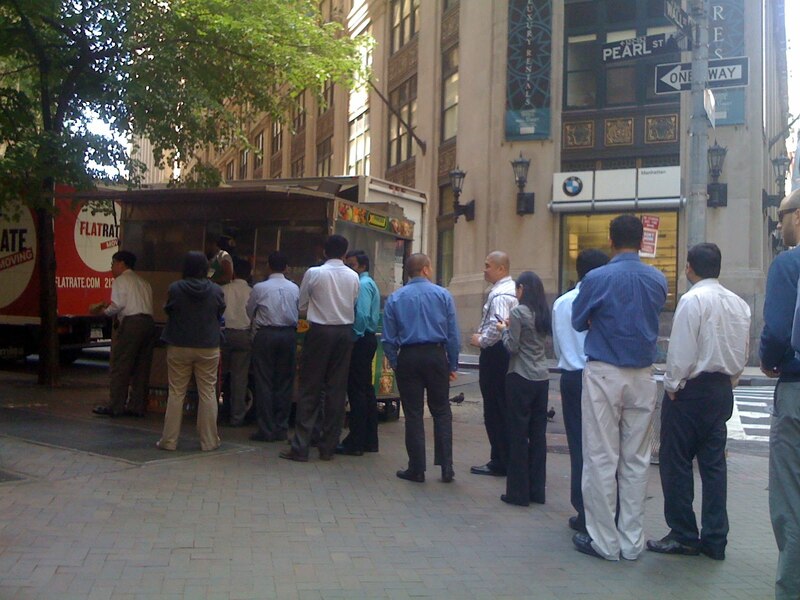 Anyway, the cart I go to for my bimonthly culinary break from lentil burgers and tofu is really popular in the area. They always have a line, and their foods are flavorful. However, for the last month, the men who run the cart have faced a challenge: Ramadan. While many Muslims choose to slow down during this period, for those who make their livelihood as food cart vendors, it can present a personal challenge: They are surrounded by foods that they themselves cannot eat all day long. It creates a challenge for the individual, but also for the business as they have to rely on sight and smell to gauge flavors. The cart that I frequent is run by a group of men. The owner of the cart has been off for the entire month, leaving his "staff" (I am not clear whether they are partners or simply his employees) on duty in his absence. They appear to have rotated on a weekly basis, manning the cart in pairs so that they too have had some time off. popular chicken and rice cart. I had a chance to speak with two of the chefs on duty as they were packing up the cart last week. Salim and Amir** worry about the products they sell during Ramadan, but feel that there is no other way. "We cannot taste the foods that we are preparing, so we work with a spice mixture and hope that it is the same," Salim said. Salim added there is usually a drop off in customers during Ramadan, but it is expected. "The chicken and the kebabs come out differently during this time since we don't eat meat and cannot taste the mixtures. We have to hope that our recipes and our measurements are right." The two view their occupation as a personal test during Ramadan. They have chosen this line of work as their livelihood, but it can still be a challenge to smell the foods all day. "It's hard. Of course, it's hard," Amir said as he vigorously wiped down the grill. "But this is part of the test. We must work. Our business would not survive if we took the cart out of business for a whole month. Life is different here; our customers would go somewhere else." Many of the Muslim food vendors in the area today are off as they mark the end of Ramadan. The corners where they normally park their carts look oddly empty without the lines of customers who wind around the block. But I'm sure that Salim and Amir have nothing to worry about—the customers will be back come Monday. Eid Mubarak to those who celebrate! *This is not meant to be a comprehensive discussion of Ramadan. There are many great resources available for readers interested in learning more. Please see here, here and here. **Names have been changed at discussants' request. The names used were chosen by discussants. Thanks for this clarification! I was driving my husband to work this morning and saw huge crowds around the locals mosques and people leaving in traditional Muslim dress. There were people everywhere! I didn't realize that today is the end of Ramadan, although it had occurred to me. Learning a bit more about the practices is a great way for me to understand a bit more about what's going on in my city today! Glad it was helpful, Ellison!